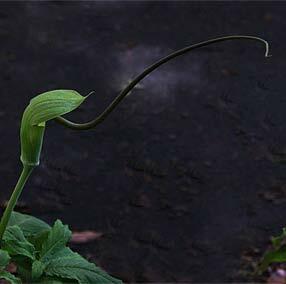 Cobra Lily or Jack in the Pulpit. Arisaema are a woodland plant and as such prefer a cool semi-shaded position and moderately rich soil, species include the attractive Arisaema candidissimum (picture right lower) with scented flowers and great foliage which lasts through summer and Arisaema sikokianum with its glowing white spadix hooded and fascinating. Much sought after is the lovely A. griffithii a little rare in Australia at present. 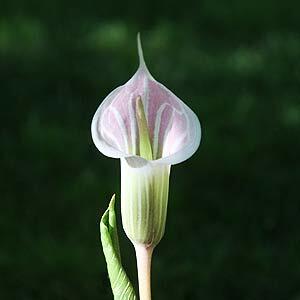 These bulbs are also referred to as ‘Cobra lilies’ and ‘Jack in the Pulpit’, but with so many species the botanical names are best used. Fertilizing, watering and dividing & general comments : Arisaema may be left undisturbed for several years, mulch lightly with a good well rotted compost late in winter. Refrain from watering these bulbs during winter, but water well once a week spring through summer. To help growth top dress in late winter with a complete fertilizer. Plant 4-5 cm deep, 10cm between bulbs. They do require a well drained soil and some species will tend to self seed, so remove seed heads as they form if this is an issue. Seeds are generally heavy so they tend not to blow around the garden.